Hooray, it is giveaway time! 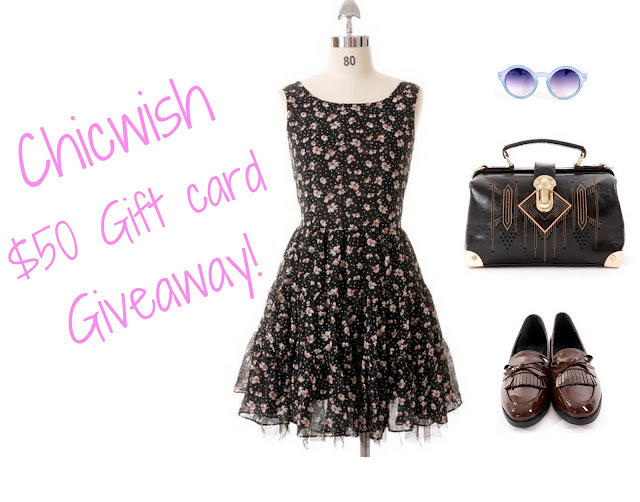 One of my favorite brands, Chicwish is offering not one but TWO of my lovely readers a $50 gift card to their rad shop. I am just in love with their many vintage-inspired pieces and am so excited to share this brand with you all. 3.) For an EXTRA entry, like Chicwish's Facebook page, or follow them on Pinterest. Wow! An amazing giveaway, thankyou! hey! Thanks so much for the giveaway! I have an account, i liked their fb page, and followed them on pintrist! Oh and I'm already following your bloglovin! I registered, am following you on bloglovin'. it's so fresh and feminine. Plus, it looks super comfy. For an EXTRA entry, like Chicwish's Facebook page, or follow them on Pinterest. already registered and like Chicwish facebook fan page also follow your blog lovin. Follow them on Pinterest and "like" them on Facebook. I love that leopard print slip dress! I've been following you on bloglovin', under the same email address, and I've liked their Facebook page (Ruz Roz) and followed them on Pinterest (Ruzanna). Thank you so much! I really like their black lace shorts! I follow you via bloglovin' and already liked Chicwish on facebook! I also liked their page on fb. Also liked Chicwish on FB and pinterest! I registered, follow you on bloglovin and follow them on facebook. I also liked their page in Facebook! I'm now registered and I've started following you on bloglovin! I love the simple chic scrolled trim top! Ooo thank you for turning me to Chickwash! 1. Love Chickwash.. registered straight away! Oh that little dress is adorable! I'll go check out their lookbook. It will go with everything! Yay! I love their clothes - so vintage and pretty! Already a follower on Bloglovin & GFC! And I liked Chicwish on FB as "Elle Vox". Followed you on Bloglovin, liked Chicwish's FB page and followed them on Pinteret! I like this crochet sweater because it's so versatile. You can wear it over a patterned romper on cool summer nights, with some jean shorts to a carnival, or just over your bikini on a breezy beach! I also like the pink version. :D And I've been following you on bloglovin' and I've liked Chicwish's FB page! registered on chicwish, liked them on pinterest and facebook, and im following you on bloglovin! You're so vintage, i like it! Love ur any flower dress. I love so many things from Chicwish but my most favorite is the Contrast Collar Waterfall dress. Thank you for this wonderful giveaway. I do hope I win but good luck to all the people who entered. i already follow you on bloglovin' and i liked chicwish's facebook page! you're my inspiration! thank you so much for having this giveaway. Love this dress: http://www.chicwish.com/laidback-artist-waterfall-dress-in-off-white.html . Also followed Chicwish on fb. They are so unique and wonderful! Also followed you on bloglovin'! I already follow Chicwish's Facebook page as Karen Ou and on Pinterest! Followed on Bloglovin and liked on Facebook! What a lovely giveaway! I registered an account on Chicwish and and liked their facebook page. My favorite look from the lookbook is the burgundy dream tulle dress. It's so beautiful and unique. I follow you on bloglovin', facebook and twitter... and Chicwish on facebook. I liked Chicwish on Facebook too!! Am registered with Chicwish and follow you on bloglovin! Made an account with Chicwish and love their Galaxy Print Chiffon Dress! I liked chicwish's facebook page too! I love the Aurora maxi dress! I fell in love with the Lavenda sleeve shirt! I really love this galaxy print shirt. Very, very unique. You can't really find these kinds of prints anywhere else. Just gorgeous. Absolutely in love with the "Floral Crochet Shorts in Teal." My birthday is Sunday - I know where I'm asking for gift certificates to now! I'm also following them on Pinterest (because my online closet needs to be bigger right?) lol. Thanks for sharing!!!! I like Chicwish on FB! I like the Best Lace Forward Shirt in Pink! And I follow you on Bloglovin. i am following you on bloglovin' and i got an account on chicwish. i love the floral crochet shorts in peach! In love with the Galaxy Print Asymmetrical top by Chic+ and I've already registered and been following! I've also liked Chicwish on Facebook! hi! so excited for this giveaway! I registered an account under the email, ambylynx@aim.com! and I followed them on pinterest! I'm also following your blog through bloglovin. I follow you on bloglovin + I'm fan of chicwish on facebook. I follow you on BL and I'm following their FB! Liked Chicwish's Facebook page (FB:chinda phraph), and followed them on Pinterest(chindaphraph). I follow this blog through bloglovin' and I registered to Chicwish. This is my favorite piece, I could pair it with so much and it looks like a great quality! all things are stunning, but this blouse is simply gorgeous!!! dress so beautiful and these outfits make it more useful for me......bag, shoes, etc so cool! !